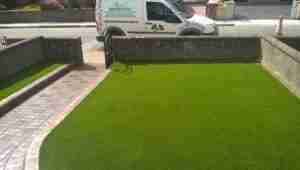 This is an artificial lawn we recently installed in Drogheda, co.Louth. 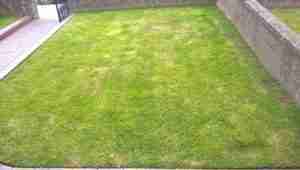 Our clients here no monger wanted to keep the lawn as it was becoming a chore to,look after. 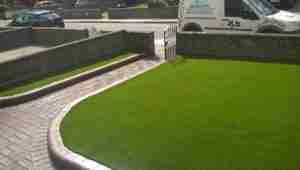 They decided to go for Royal grass 35mm pile product which is very hard wearing and realistic. It has a unique v;shaped grass blade which replicates natural grass and becomes The ‘backbone’ and strengthens the fibre while he shape itself keeps the fibre nicely upright for a longer period compared to normal flat artificial grass fibres. The soil was dug out to appropriate levels and back filled with layers of stone and sand to aid drainage. Its particularly suitable for gardens with poor drainage also rather than digging drains into the lawn. 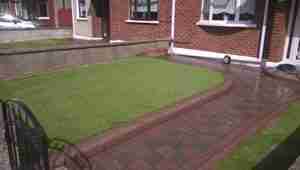 A complete low maintenance solution for those who do not wish to have a lawn to look after but like the look of one rather than paving or gravel or other alternative solutions.